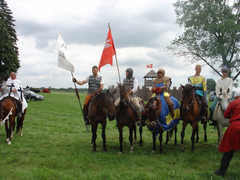 Chelm Standard knights of Prusai nobility during the anniversary celebrations of the Battle of Grunwald, had the glory to its unveiling. 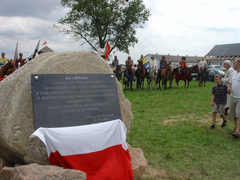 The unveiling took place at the end of Lodwigowo and before the battlefield, in the historical place of departure, in the presence of the Brotherhood of the Knights was the unveiling. This is the first time that the Prusai were given the respect due ​to them. At the turn of the fourteenth and fifteenth century, the political situation between the Polish Crown and Teutonic Order in the land of Prusai, matured to a serious armed conflict. Both parties were very active through diplomacy, trying to gain the greatest number of possible allies. In retrospect, becomes apparent that the Polish Crown alone was not able to counter the military might of the Teutonic Knights, who had behind them the knighthood of Western Europe, particularly Germany. Wladyslaw Jagiello, a Lithuanian, was the Polish king, and was well aware, because all the Polish diplomatic efforts were directed to win Lithuanians, Ruthenes and Tatars against the Order. Those nations under Polish command, jointly appeared in arms against the German knights. Knowledge of the battle, after hundreds of years, has a lot of inaccuracies and is often uncritically described. Special attention will be drawn, to the lack of mention of indigenous Prusai, and their participation in the armed conflict. Around this same time in 1397, the Ancient Prusai of the Chelmn region form the Lizard Society organization. This body was semi-secret, and still to day we do not know the names of all the participants. The Society was approved by the Grand Master of the Teutonic Order, most probably, to faclitate the tracking of their activities and intentions. 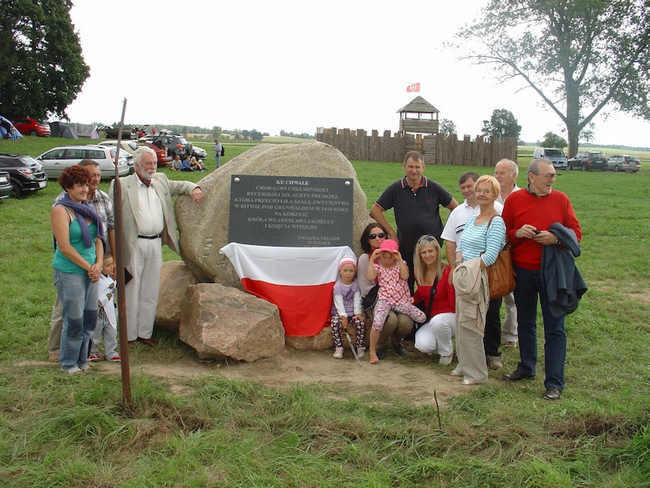 The objectives of the Society, were national and social with a desire to draw the Chelm region and Prus lands to the Polish Crown. Jagiello with his nearest staff, knew beyond any doubt the Prusai hostile sentiments against the Teutonic Knights, and contacts with the Lizard Society were made with greatest secrecy. Jagiello had one more ally, the Prusai, who proved later to have made a big impact on the outcome of the Battle of Grunwald. From the coat of arms, it could be seen that 26 members of the Lizard Society, the Prusai nobility, belonged to knights of the Chelmn Standard. Since their land was in the hands of Teutonic Order, they had obligatory fealty service to the Teutonic Knights. Right from the beginning, both sides benefited from their intelligence services. Although the leading part in espionage was with the ruthless and hated Order of the German knights, they could not count on the sympathy and loyalty from their subjects, the Prusai population. The main guide on the Polish side John Grinwald a Prusai while allied troops marching, friendship connected him with a Prusai knight of the Chelmn Standard John of Durag. After the Grunwald Battle, John of Durag was to win the Ostroda castle for Jagiello. 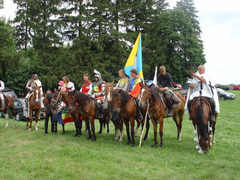 On the territory of the indigenous Prusai, while on march, near Kurzetnik, Jagiello received information that when crossing the river Drweca, the Order had prepared an ambush. The Teutonic Knights while marching to the fields of Grunwald, gathered reinforcement which were arriving from all sides. Jagiello, and von Jungingen, both played the game of disinformation. The question whether an ambush in Kurzetnik was a hoax of, as to extend the march of Jagiello,s troops, to gain more time for the Order to gather forces, as they at the time, were not ready to fight the battle. New knights continued to come in, and needed time to fill strategic positions at Grunwald. The German Knights prepared for the battle with the greatest care. The strategy prepared by Order, was the arrival at the battlefield before the army of Jagiello and to seize the privileged best positions in the landscaping and wait in full readiness to start the battle. 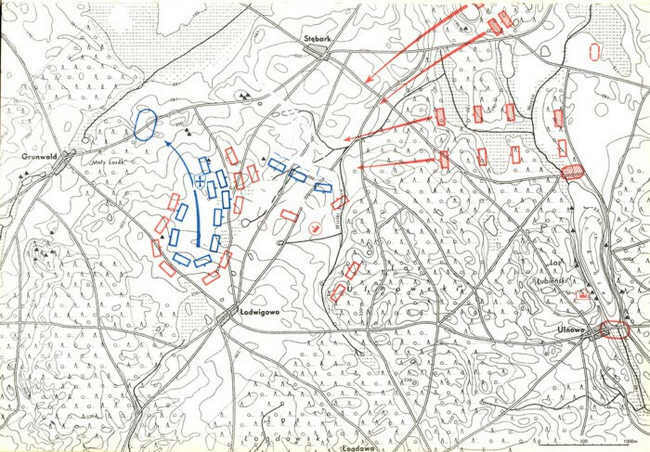 The battle had to be played according to the already devised strategy and tactics. The area occupied by them, was in the form of a triangle, Stebark will be referred to as a left wing, Lodwigowo right wing and Grunwald at the rear of those wings, where the Order was encamped. The land formation at the site, in front of the left wing terrain, stretched gently and was not wooded. The right wing, conversely, was heavily undulating and at the right ended in the forest. The distance between Łodwigowo and Stebark about two kilometers. Above map shows positioning of both armies. Blue colour Teutons, red Polish Crown. Each side had not less than 20 000 men in arms. All of the Teutonic knights at the full strength, from all fortresses, turned out to battle on the fields of Grunwald. For the defence of castles, retirees stayed whose glory was long behind them. With them was the local population, people poorly assimilated to fight, and decidedly hostile to Teutons. The left wing of the Teutonic Knights was of a lightly armoured knights. Artillery was at the front with a defence of infantry, and pits dug against cavalry. The right wing was further away with a gap left in between, ending up in a wooded area. The gap left between the wings was to enable the reinforcement entry of the left or right wing to the battlefield. The Order’s reinforcements were 15 units of European guests, the sixteenth’s a leading one of Prusai Chelmn nobility. The reinforcements can be estimated at about 7,000 armed men, including around 600 armed Chelmn knights. The artillery on the right wing, due to the undulating terrain became very of little use. The heavy armoured Teutonic knights were hidden behind the hills in camouflage, also stayed in a wooded area. The open left flank of the Teutonic knights and its artillery, visibile to allies of the Crown and Lithuanians was the deliberate strategy of Urlich von Jungingen. His calculations were, that the main force of Jagiello’s army would to attack the left wing. Trough the gap between the wings entry of support with reinforcements for left wing, and knights of the Order from the right wing were to hit the side of Jagiello’s main force. Thus, this strategy, if successful, would have meant the defeat of Jagiello, and the end for years of Polish struggle against the German Knights. On the back of the right wing, and closer to the left end, was the commanding position of Ulrich von Jungingen. He was well aware that the right wing would decide the fate of the battle. All of this did not happen, Jagiello before arriving to the battlefield received informations from Lizard Society of the Chelmn Standard courier, a Prusai Nicholas from Pilewice, a knight very trusted in the Jagiello camp. He had all the necessary information of the Teutonic Knights camp, thus allowing Jagiello for his army’s adequate deployment. Extremely important is the informations about an enemy at the battlefield, his location, fortifications, numbers, etc. Without this basic knowledge, even the best commander could not have been able to meet the insidious enemy. Having this knowledge during the on going battle could prove to be belated. The battle was to begin with strategy of the Teutonic Knights, who were expecting Jagiello’s attack whilst in their positions and from these could carry a deadly counter offensive. The Order attempted to penetrate Jagiello’s camp. Hanko of coat of arms Ostoja, a Prusai, informed about the presence of the Teutonic spies close to the royal camp. This was confirmed by others and the spies were chased out. The starting time of the battle began to lengthen, causing great impatience in the Grand Master of the Order. The day was hot, the knights of the Order were in heavy armour, horses were not watered, not allowed to leave their stands. A bizarre situation, which was difficult to keep up for long. Ulrich von Jungingen sent a delegation with two swords, provoking Jagiello to start the battle. Very experienced in battles the Lithuanian Jagiello relaxed and remained unimpressed with the Great Master trick. Map showing Lithuanians, leaving the battlefield in dispersion after their attack on the Order left wing. The Battle of Grunwald began in the early afternoon, with a charge by the lightly armoured Lithuanians, Ruthenes and Tatars, at left wing of the Order. Artillery pits crossed, the artillery gunners cut down, their protection infantry cut down and then they clashed with the knights. Their task was performed with considerable losses. The Lithuanian army used the eastern style of fighting, in retreat scattering to their camp, and reorganizing for counter attacks. The Order’s knights left wing, had fallen into a trap, perhaps being over emotional and confident that the retreating Lithuanians were deafeted. Thus the Order’s left wing, which pursued the Lithuanians, left their positions much too early and ceased to exist on the battlefield. This had not escaped the attention of Urlich von Jungingen, who seeing the Jagiello’s lightly armed force attacking the Teutonic left wing, broke down, some say he began to cry. His entire strategy became ruined, and in addition the irresponsible act of leaving the field by the left wing caused its final devastation. Still, they had to wait for the battle’s end. Soon after, the right wing entered the battle, fought between the cream of knights on both sides with great emotions, some to stay alive some to win, as pictured in Jan Matejko's painting “The Battle of Grunwald”. To save himself, the devastated Grand Master, threw his last reserve force, the guest‘s heavy armoured knights of 15 standards, with a leading one of the 16-th Chelmn Standard. It was not a derisory force, modestly assuming 400 strong per standard, which together makes 6400 armed people. Their aim was to circumvent the heavy armoured knights of Jagiello, which could cause a deadly panic, and then the victory for the Order’s side would take place. 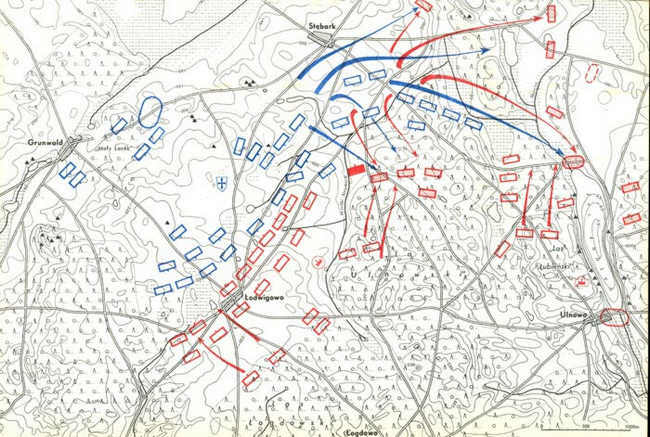 Their entry at the battlefield was in order of column by column, reaching the aim of a 90 degrees turn to the right and charging at the back of Jagiello’s fighting forces. Coming very close to the Jagiello’s commanding position, surprisingly they found no resistance. The guest knights without Teutonic black crosses, were not recognized by the Polish knights, a knight from Meissen standard, charged the king. 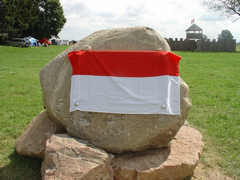 Some said, there was a threat of losing the royal Polish standard. For the moment only, the knights of the Order, believed in their victory. A very considerable force, the elite of European knights, should have played a major role in the battle. They did not play such a role. 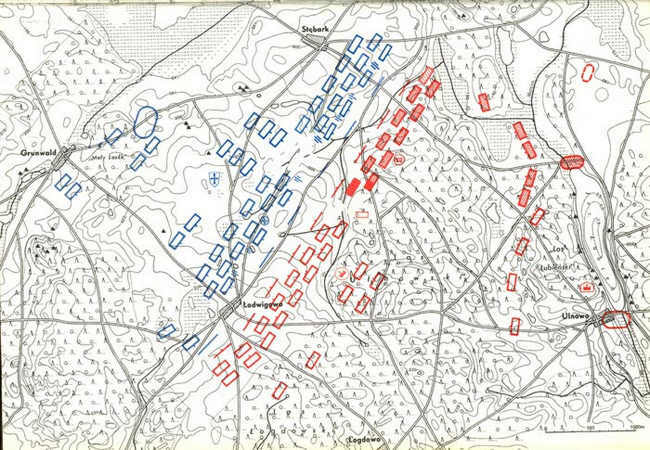 Map shows the last phase of battle. Three blue rectangles on the right side shows the Order’s relieve forces. Quite unexpectedly, to everybody’s surprise, the leading Chelmn Standard when in front of Jagiello rolled up their banner, giving the sign to the king of their surrender, some other standards behind the Chelmn did the same gesture. This behavior most unexpected, caused incredible confusion among the guest knights, sufficiently long enough the Polish knights to recognize the Teutonic guests. Returning Lithuanian - Ruthene -Tatar force finished off, who had no desire to surrender. This battle happenings, as yet have not been taken into any account by historians. Incredible and no one explains it. Victory in the Battle of Grunwald, had been achieved by the Polish heavy armoured knights. The Teutons summing up their defeat, gave reasons, lack of fighting spirit at the Order’s left wing of the Prusai lightly armoured knights. Their estimated number, was 5000 men, but the direct cause of their disaster, was betrayal of the Chelmn Standard. Polish historians ignore this fact. It is acceptable, that one standard could not win the battle, still their behavior as the one in front, surrendering, stopping others, tipped the victory to the Polish Crown. The Order was right, the behavior of the Chelm Standard helped to destroy the last Order’s manouver and decidedly gave Jagiello a greater chance for the victory on the fields of Grunwald. Historians, for centuries, completely ignored the role of the Prusai in their relations with the Crown, specially those at the turn of the fourteenth - fifteenth and the fifteenth centuries. The Chelmn Standard, of the Chelmn land ruled by the Teutonic knights, had to participate at the battle on their side, as they were compelled by oath to obey them . Despite these commitments, the knights of the elite Prusai nobility were determinately hostile to them, and at the same time they were also in a close contacts with the Polish Crown. All of them were members of the Lizard Society. The Lizard Society political goals, expected from the Crown support to break away of the Chelmn land from the Order and join it to the Crown. With the great certainty, these contacts were related to Jagiello’s most confidential people, Poles were too distant, contacts harder to arrange, their attitude was dismissive to the Prusai. The unpredictable consequences on the part of the Order, required maximum secrecy, their spies were everywhere between the Polish and the Prusai. The knowledge of the Teutonic army disposition at Grunwald, for Jagiello had been of great tactical importance. This knowledge, could have only come from Lizard Society, whose armed knights were in the middle of Teutonic camp, and could only be provided by one who enjoyed the full confidence of Jagiello. The man who could have done this was Nicholas of Pilewice, member of the Lizard Society, and knight of the Chelmn Standard, on him alone the first suspicion was directed by the Teutonic Order. Soon after the battle a search of his estate was conducted by the Order, and hostile correspondence with the Polish Crown, and shreds of Polish pennants were found. These shreds of pennants, the Crown couriers identified with Nicholas from Pilewice. This evidence was sufficient for his arrest, and without trial the death sentence was performed. Jagiello’s large group of guides was led by the Prusai, Trojan from Krasny Pond and John Grynwald, friend of Prusai knight Nicholas from Durag, the conqueror of Ostroda castle. They had close contacts with the Lizard Society, possibly even by family ties. The Chelmn Standard was among the guest knights from Europe, it was the last of Order’s reserve standards. The Chelm Standard not only represented Prusai from the densely populated Chelmn Land, but also from the neighboring lands. In the Battle of Grunwald, their number can be assessed as 600 strong. We know from the number of their salaries paid during Teutonic raid on the Dobrzyn land, the Chelmn Standard was with 333 armed men. That was not a full mobilization. The Chelmn Standard represented a serious strategic force with experienced knights and not as historians try to downplay it. Many of them took part in the Baltic’s Teutonic conquest, of Gotland island. Thus surrender of the Chelmn Standard upset plans of the Grand Master’s strategy which depended on encircling the heavy armoured Jagiello knights. The historians repeatedly and frequently talked about the Chelmn Standard activity in fighting against the Crown at Grunwald, that they surrendered only then when the defeat of the Teutonic Knights was obvious, but this has no evidence. After the battle, there is no mention that among the knights of the Chelm Standard or Lizard’s Society members, that there were any losses, and this testifies against the assertion of their active participation. For example, Gdansk, delivered 1200 warriors of whom only 300 returned. Should the Standard of Chelmn, had fought bloodily in the Battle of Grunwald, then it would not be able to show great freshness in their military gains, conquering castles for Jagiello. None of them were taken as a prisoners of war. The mere submission of the Chelmn Standard and a few others, led to slow down the attack of the 16 standards, as well caused total confusion in their ranks. This gave precious time for Jagiello to reorganize his military ranks. There is no evidence that the Crown was prepared for such a happening, and did not even recognize them as a hostile standards. If it was not an act of surrender, the battle could have had a much different outcome. 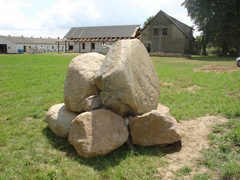 The Polish version of the battle according to Jan Dlugosz, was done well after the battle and from a doubtful stories. Shortly after the battle in the annals of the Order they themselves wrote that the Battle of Grunwald was lost because of the betrayal of the Order by the Chelmn Standard. Such examples could certainly continue, the decision breaking the knights oath is not a common act, directed only by the highest moral principles. The escape from their native land and seeking asylum from the revenge of Teutonic Knights was not without a reason. For historians it was just a happening. The Prussian Chelmn nobility, after the victory at Grunwald expected much more from Jagiello. They were met with a great disappointment, losing their life at hands of the Order, and at best asylum in Poland, received nothing from the Crown. Combat behavior of the Prusai nobility, as well of their enslaved Prusai population remains unnoticed, the abandonment of knightly oath in order to support Jagiello, was clearly disregarded by Polish participants of the battle, by modern historians, as well as in the present Polish historical literature. After the allied victory over the Teutonic Knights, the Polish side did not have any intentions in relation to the Prusai land and its people, or that the local allies could develop a strategic barrier to the Teutonic ambition to continue their military activities. Leaving the Prusai crews at castles captured by them could be a precedent in securing Crown borders. 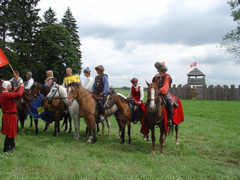 Their loyalty was shown by local crews of conquered castles, and two knights, Nicholas of Pilewic, Jan of Pulkow, captured castle Kowalewo, one knight Nicholas of Durag captured castle Ostroda and "Teutons were pulled out by their beards" there were many such events. It was not obvious to the Polish command, that a small Prusai nobility was not only of very high esteem among the local community but also had considerable impact on them. The Prusai if in control of castles, would still be hosts of the land, allowing the Crown to maintain a real control of these lands. The Polish side did not have any political strategy, though the peace treaty was signed by the Teutonic Knights, but as later events proved meant nothing. The Lizards - the Chelmn Prusai nobles received only asylum and nothing more from Jagiello, those returning to a native land suffered the loss of their lives at the hands of the Order. Thus ended political aspirations of the Prusai descendants with Poles, to whom can be attributed a complete lack of any strategic and political thoughts. As a result, this led Poland to a national disaster, loss of independence. Poles were able winning battles, but much worse was with the wars.